The Daily Digress: Three New Things I know. Three New Things I know. 1. Maybe I'm the last person to know this one. If so, you are all jerks for not sharing. Actually, I know I'm not the last, because my friend and fellow blogger Tracie was tickled pink when I shared my new knowledge. What is it? Well, I finally figured out how to take a decent photo inside, with bad light conditions...with a point and shoot camera. My sister-in-law, who is an actual photographer, like for money and stuff, explained to me that it's all in the light if you don't have a fancy camera with settings that would probably confuse me anyway. So true - anyone can take a great picture outside. Without further ado, here is my new secret, which is not a secret at all, but was a secret to me. This is my camera, a Leica C-LUX 2 . The arrow points to what makes the Leica so pricy: that cute little red badge. It cost more than it should because it's stylish. 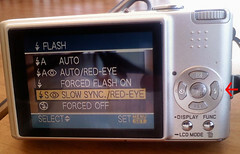 Also, the features, which may be the same as on my old camera, are very easy to use. In fact, I discovered my new trick when I was kind of tipsy and accidentally hit the wrong button with my finger. Yay for me! First, set the exposure on your camera as low as it will go. On mine, you push the button indicated below by the arrow. Next, set your flash. I have no idea what this slow sync thing means, but I like the way the pictures turn out when I use it. The arrow points to the button I have to press to set the flash. Anyone reading this who is a real photographer may be cringing and muttering about stupid twits with over-priced Leicas who don't know what they're talking about. Go ahead. I don't care. You're right on the money. But now I get surprisingly decent photos at parties. Your mileage may vary and don't send me any questions about this technique because I will not know the answer. The pictures of the camera, incidentally, were taken by a window in the middle of the day with my LG Voyager phone. 2. If you are wearing a cashmere hoodie on the elliptical and have your headphones plugged in to the console on said elliptical and you've been dying to try electric shock therapy but can't afford it, take off the sweater without removing the earphones. I did it and lost my hearing for an afternoon. And it wasn't just that particular elliptical, because I tried it at another gym on a different brand of elliptical and it hurt even worse. I also tried it on the original elliptical with a cotton hoodie and nothing happened. Perhaps someone has a neat little explanation for why this phenomenon occurred. I think it's kind of like the time I was in my friend's garage and had one hand on her dad's car, the other on their outdoor freezer and, briefly, no feet on the ground. Ow! Then there was the time I was mixing batter with Iona, my old-school mixer. Iona was a wedding gift to my parents and I love her. 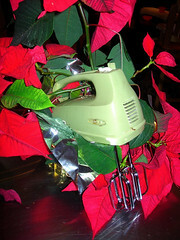 The cord, which comes out of the wall socket and the mixer itself, came loose from the mixer and fell into the batter. Without unplugging it from the wall, I picked it up and licked it off. Ow! My brain vibrated for days after that one. Luckily, I was too disoriented to call DSS on myself. Did I mention I had a toddler in a backpack? He screamed too, which may or may not indicate the current reached him. You can't prove it and he's fine now, so whatever. 3. How to make those damn good ham biscuits my friend Suzi (owner of both Suzi Cooker Catering and the divine El Burrito) made for the Tank's baptism. I can't tell you, either, because I swore I wouldn't. Imagine little mouth-sized biscuits, fluffy and piping-hot, stuffed with something delicious involving ham. They're in my freezer right this second. Love the biscuits, love her. The biscuits were awesome. Thanks.